Since we're expecting another hot day here in Wisconsin on the 4th of July, what better way to cool down than to take a trip down memory lane with me? Back in January (wow, am I really that far behind in my blogging? ), I met with Jenna and Connor and Benny to document Jenna and Connor's engagement. To be fair, we actually had an incredible unseasonably warm day then too. It's not often Wisconsin sees 50 degree weather in January, but we were happy to have it! 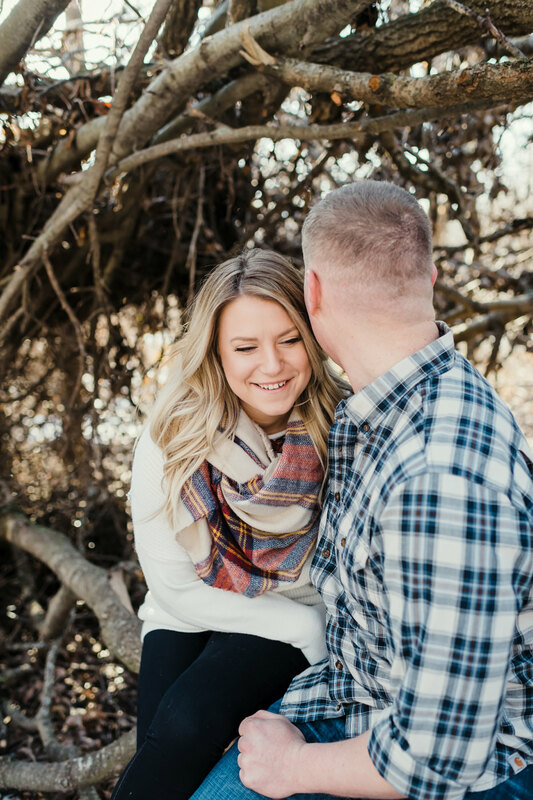 Jenna and Connor are planning a beautiful destination wedding in Punta Cana, and I am so thrilled and looking forward to joining them there in about 6 months! Yes, I am totally counting down already, and I've been tracking flight prices since the first moment Google Flights would allow me. Since I love to travel, maybe someday I will sell most of my belongings and make a living shooting weddings all over the world, but for now, I will be content with the occasional destination wedding. So if you're planning a wedding somewhere other than Wisconsin, but you want to have the peace of mind of hiring a wedding photographer you can meet in person before your big day, then let's get together! I would love to work something out with you! !